As we continue with our build up to this weekends FA Cup Final between Lewes and Hampton and Richmond Borough, something exciting arrived at EFW Towers this morning which I'd like to share with you. 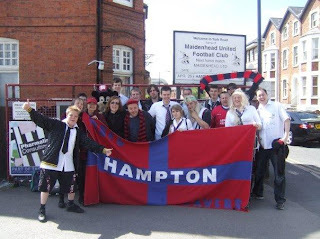 To BEaver Or Not To BEaver is a fly-on-the-wall documentary telling the story of Hampton and Richmond Borough's most successful season (08/09). The DVD includes interviews with gaffer Alan Devonshire, players and supporters as well as special (special!) extras. The soundtrack was composed by the acclaimed Grammy nominated composer Sandy McLelland - a dedicated Hampton supporter. The film is the first offering of newly established film company 'Live Forever Productions'. Join us tomorrow as we continue the big build up with a special edition of a Question of Sport complete with a Lewes and Hampton theme - possibly. Looking forwards to the game tomorrow I think we've got a pretty good chance of winning the game. H&R are the team that got beaten in the Play off final by our neighbors Eastbourne Borough, right? Ive been to Lewes three times in the past year and still haven't seen them lose yet! A lucky omen or what! Sponsored any match balls lately! ?